The solid construction of this housing makes it suitable for heavy-duty applications, such as the surveillance of ovens, foundries and other hightemperature environments. 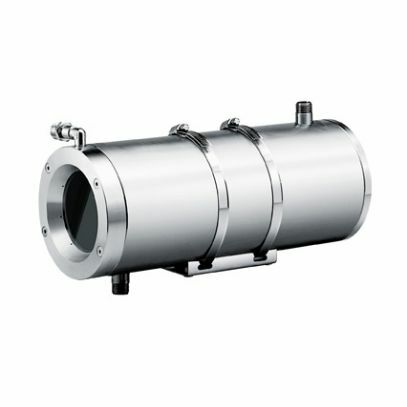 The NTW housing, made of polished stainless steel AISI 316L, can be equipped with zinc selenide glass designed for thermal video cameras with a wavelength from 7.5μm to 14μm, or sapphire glass for shortwave thermal video cameras, with a wavelength from 0.75μm to 4.5μm. The NTW consists of a body with a double chamber for the circulation of a cooling liquid or air. The NTW is enclosed by two thick flanges at either end and allows cables to pass through by means of two PG13.5 cable glands on the back flange. Two 1/2” GAS connectors allow for the cooling liquid inflow/outflow. The NXW is equipped with a flange designed to create an air barrier in front of the glass. This prevents the formation of dust deposits and attenuates the heat of the glass itself. With the supplied air barrier, the NXFIGRU filter group is recommended, to purifie the air drawn from a compressor.